If you are into cooking, you’d know the importance of precision and technique in making of a perfect delicacy. One of the most commonly used foods is sugar, especially caramelized sugar. Caramelized sugar is a term that often refers to melting sugar until it becomes a caramel-coloured liquid. It is the browning of sugar, a process that’s used in cooking for the sweet nutty flavour you enjoy in candies, ice-creams, frostings and puddings among others. It may be used in some savoury preparations too. The process of caramelizing sugar may seem daunting; however, with the right technique, you may just get it right. We tell you how to caramelize sugar and ways you can use it to up your dessert game like never before. Hints: You may want to brush your chemistry skills. What Is Caramelization Of Sugar? The process of caramelizing sugar involves snowy white sugar granules that are heated either solo or mixed with water, which changes its form (liquid) along with its colour and flavour. Caramelized sugar resembles nothing to its original form, and the result allows the user to bring the caramelized sugar into any use. Let’s look at how you can caramelize sugar. What Happens When You Caramelize? When sugar is combined with water and heat is applied, a solution called simple syrup is formed. As the temperature soars, more water tends to evaporate, resulting in higher concentration of sugar in the mixture. Exposure to high heat can lead to decomposition of sugar, which further becomes liquid. When heated further, it begins to turn darker in colour and tastes nutty; this is the final product that is used in several dessert recipes. Take a saucepan, add sugar and water and stir it well on medium flame. Bring it to a boil. It starts dissolving at approximately 160 degree Celsius. At this point, the syrup should turn clear in colour. Now, take the lemon juice and mix in a few drops of water to dilute it. Add the lemon juice to the sugar syrup. This process helps prevent the sugar from recrystallization. Don’t forget to stir well. Once the mixture comes to a boil, stop stirring. Now, on a medium flame let the syrup simmer for about eight to 10 minutes (also depends on how thick or thin you want your syrup to be). Make sure are not stirring it as stirring allows the water to evaporate faster. It can also incorporate air into the mixture and reduce the temperature of the syrup, which can prevent the sugar from browning properly. Keep your eyes on the mixture. It should turn from white to a light golden to dark amber in colour. This can happen within few minutes; therefore, it is important to prevent leaving your saucepan unattended. When the mixture reaches a uniform dark brown colour, that’s when you know caramel is ready. Don’t leave the saucepan on the stove, else it will turn black in colour and may have a burnt bitter smell. Place the bottom of the saucepan in ice water for about 10 seconds. Voila! Your caramel is ready to be used. The dry method is a quick process, meaning it can burn quickly if not attended to properly. The best part about this process is that you don’t need anything else but sugar. Here’s how you caramelize sugar using dry method. Add your desired amount of sugar in a saucepan and start to heat it on a medium flame. As you heat the sugar, it tends to release its water and caramelizes. The sugar will begin to turn into brown colour. Make sure you are stirring well, so that sugar caramelizes evenly. The sugar will melt unevenly and may look lumpy. Just lower the heat and continue to stir. Don’t focus on the lumps; stirring will eventually help them caramelize well. Carefully observe the changing colour. The colour should be dark amber to know if the sugar has been perfectly caramelized. 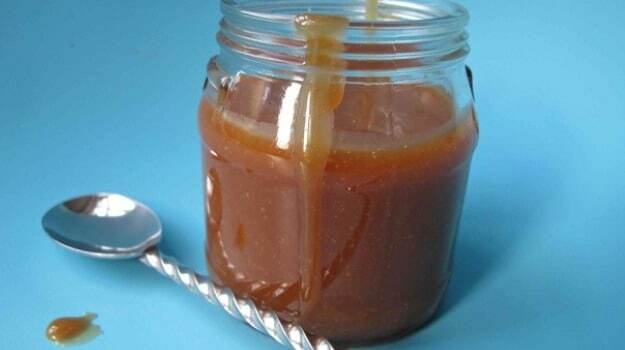 Once caramelized, quickly remove the saucepan from heat and put the bottom in ice cold water to avoid burnt caramel. Your caramel is ready to be used. It’s definitely not difficult to caramelize sugar, but it’s all about keeping your eyes open. Go on and add this delicious caramel to your creme brulee, ice creams and other yummy confectioneries!